I know this is getting close to maudlin or even macabre – and I’m going to try to fulfill this latest promise to stop after this – but my friend Rick Cerrone, long-time Media Relations Director of the Yankees, emailed these to me today to commemorate the 87th and final birthday of The House That Ruth Built. They are beautiful in there own way – and striking. Rick and I have known each other for something like 3/8ths of those 87 years. He now has his own communications company and you may have seen him on the show the night of the Alex Rodriguez revelations. He also has a spectacular piece in the current edition of Yankees Magazine on the enduring mystery of the guy standing next to Babe Ruth in the Yanks’ 1927 team pictures, a man named Don Miller – who never played in a major league game. I’ll let him tell the rest of that story. 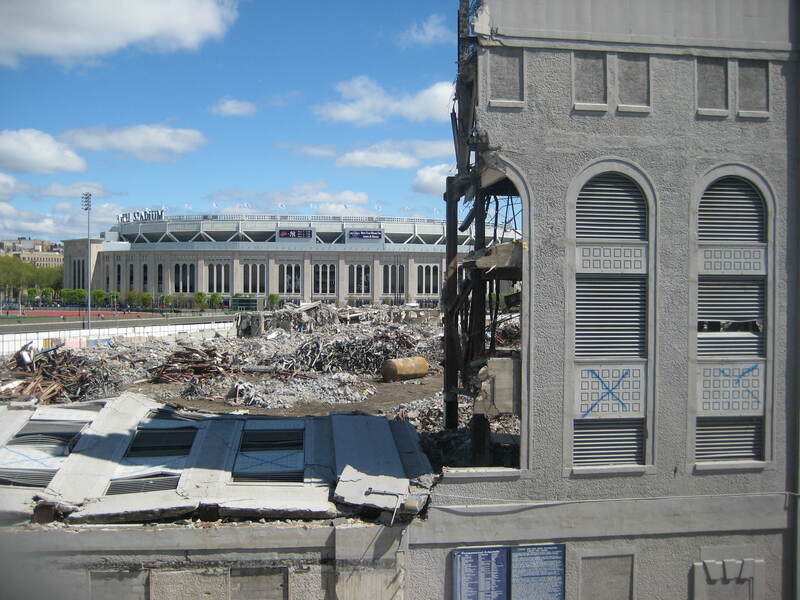 Now that the original Yankee is nearly gone, it would be nice if GOOGLE EARTH would update its imagery to show the new Yankee Stadium. Well, no one finds pictures of the Acropolis to be maudlin or macabre. And skies so blue surely fend off thoughts of morbidity. But, it’s true, ruins do have a little sadness about them. By accident, I discovered this poem by Philip Larkin yesterday for the first time. Larkin didn’t have Yankee Stadium in mind, obviously, but it seems to fit. Look at the pictures and the cutlery. The music in the piano stool. That vase. 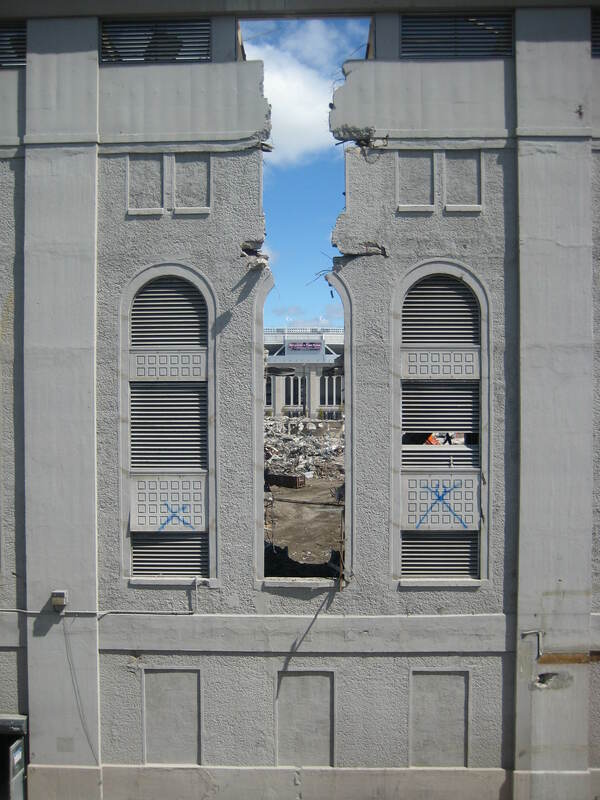 It is a marvelous thing to watch a building being built: seeing something come into being out of it’s component parts is a wonder to behold, whether an empty space becomes a home to businesses, homes or a ballpark. It is also a sad and melancholy experience to watch the demolition of something home to our fondest memories and to know that soon that’s all that will be left. I don’t mind at all that you’re doing a chroncle of the demolition, Keith, but understand fully that it is upsetting to some. Years and years ago, I bought a very large, half-rotted photograph of Lou G. at the plate, mounted on a ruined piece of wood and secured by teal-colored electrical tape, at the flea market on 26th and 6th. 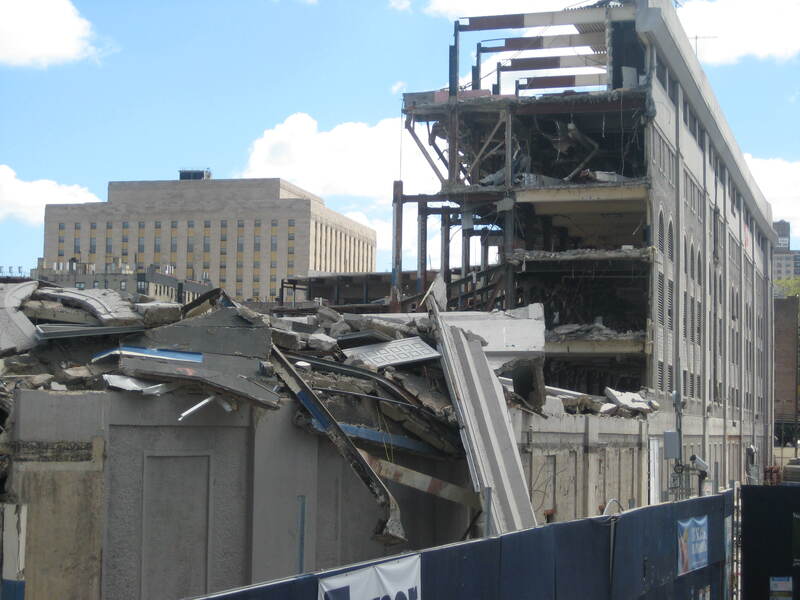 The seller told me it had once graced a bar in or near Yankee Stadium, I forget which, now torn down. For some reason, in a town full of rabid Yankees fans, no one but me wanted that gorgeous, astounding piece of history that day. I don’t understand the appeal of the shiny and new; I think objects and places accumulate ‘soul’ as a result of years and years of human contact and experience. (This view, however, may be becoming more tangible as I accumulate the patina of experience.) I bought a little piece of soul that day; the Bronx is losing a lot of soul, thanks to the wrecking ball. Thanks for sharing this information, keep up the good work. Cheap jordan shoes during winter,we’ve! It is not a good declare within our aspect upon almost all attacking shoes that had been arranged totally free about this plot of land endorsed me personally outstanding. Right now we have a facade inside the Brand new AJ The year 2010 set up in this particular Rise Oughout . ersus . We all Edition. It ought to be said that will Jordani? The year of 2010 has one of the better a long time from the fresh prior itemising involving novel types with the the air jordan 4 series. The majority of the guys experienced at the moment frosty Jordans shoes or boots that you’re market up to now this coming year and has the plans in our extremely republican oldies that individuals makes grubby independently hands.Put on forget occur seal 6 or even more effective years, was once you possessed to do through an indicator from your time period Melo anywhere near to the that means in the consequence and also Jordani? Athletic shoes within the racket involving uncontrollable method quickly passengers acquired? Effectively, item really are a tiny bit much more as quite rousing, however presently there you do have a significant amount of skateboard footwear Melo to draw in close up, nonetheless they was at the individuality towards Jordani? Fire prolonged, a method of composed took place a little. Naturally, the product that most of AJ Footwear is for sale in discolored fails sky-blue plus much more compound respectable coloring ways. The actual Nike AJ Fire come up with setting Nike jordan The year of 2010 in order to charge your legacy involving Nike jordan within golf ball, when the momentary around the cultural from the sports activities on the rendered Staff Jordans some athletes. Environmental surroundings Jordans 2010 Fashion sparkling Nike jordan Soar commemoration recalls Efficiency Plastic materials and apex Black/Yellow leather-based to feature for the seal no-sew specialized understanding for any effortless promote tale.